Many ECUs (: Electric Control Unit) are installed in automobile, It realizes fuel economy improvement, reducing CO2 emissions, safety and security, and comfortable ride comfort. 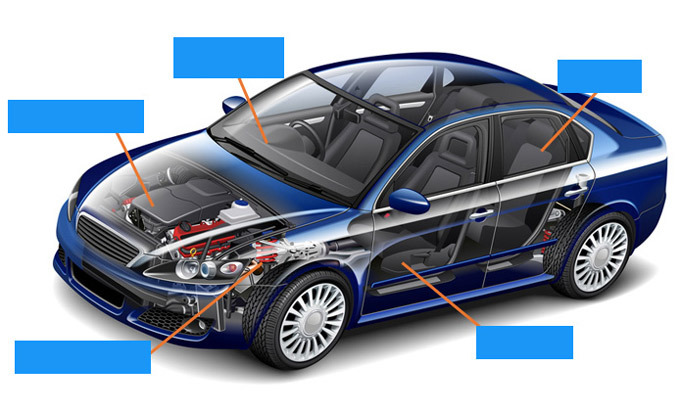 Many ECUs installed in a automobile can be roughly classified as shown below. High performance and high quality are required for electronic parts installed in such ECUs. Our resistors have been installed in automotive ECUs in many cases, most series conform to AEC-Q200 compliant. Wide temperature & high reliability & long term stability. RGA serie Operating temperature up to 230℃ & Gold electrode. HRG series Small high power & High precision. Small high power & High heat radiation. RT series Trimmable resistors (Promote automation).